The Numbers Band (aka 15.60.75) is the fount from which much of the great Ohio-based music of the last four decades emanates. If that’s too big a statement, then let’s look at the facts. The Numbers Band debut album Jimmy Bell’s Still in Town was once described by Pere Ubu’s David Thomas as “one of the great moments of our culture”, and another time as “the only good album ever recorded by anyone”. The band’s members have included Gerald Casale (Devo), Chris Butler (The Waitresses, Tin Huey), and Terry Hynde (Chrissy Hynde’s brother). 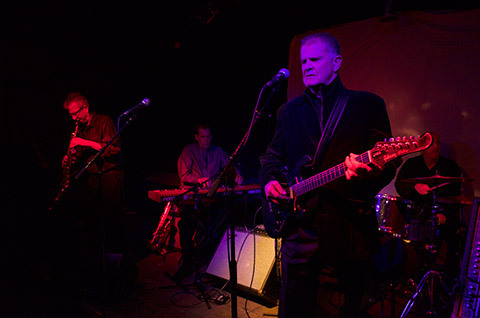 The band’s leader Robert Kidney has played with Anton Fier in the Golden Palominos, and along with his brother Jack with Ubu’s David Thomas. In 2012 Robert was awarded the Cleveland Arts Prize Lifetime Achievement Award. Locally in Ohio the band is a legend, but outside the midwest The Numbers Band is woefully under-appreciated and has never quite eclipsed cult status. On Friday night, the band returned to NYC for their first show here in many years to promote the re-issue of Jimmy Bell’s by the excellent Brooklyn-based but Ohio-centric record label Exit Stencil. It was very satisfying that Bowery Electric was packed to the rafters and the band both acknowledged and played off the energy of the crowd. Robert in particular, even given his age and recent health woes, seemed to be in great spirits and in prime form. The set began as the album does, with “Animal Speaks” and this version was on fire — we’re streaming it below. The energy never let up as the band worked through many Jimmy Bell’s tracks and a few deep cuts before they played essentially two encores. In the end it was really an honor to capture this set and gratifying to see a legendary band capable of an epic set and still around to receive the crowd adoration they deserve. I recorded this set with the Sennheiser Cards mounted about 15 feet from the stage and mixed with a fine board feed. There was some crowd yapping at the back bar that can be heard during quieter moments, and a tad bit of peak static in the vocal mics at high volumes, but those are fairly minor flaws to an otherwise superb recording. Enjoy! 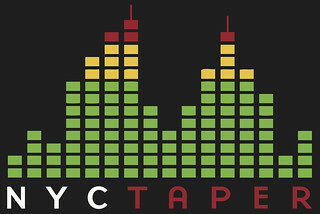 If you download this recording from NYCTaper, we expect that you will PLEASE SUPPORT The Numbers Band, visit their website, and purchase the reissue of Jimmy Bell’s Still In Town from Exit Stencil Records [HERE].